This cake is one of the first memories I have of my Californian experience. It was back in 1999, I had just graduated from college and I decided to come to San Francisco, unaware of the consequences (because after 10 years I am still here!). To be precise, in the beginning I was staying in Berkeley at a friend's house. And to finance my "vacation", I found a job in a coffeshop on Shattuck Avenue. It was the dot.com boom era and people were not afraid to spend money. Trendy restaurants and specialty stores were popping up like crazy, young millionaires with no cash flow were competing with each other on who was able to indulge on more daily luxuries, edible and not. This unusual store opened right in the middle of this euphoric climate. It was a Pastificio, specialized in making fresh egg pasta of any possible flavour and color, Meyer lemon, cocoa, lemon and black pepper, habanero pepper, blueberry, tomato, and 100 other flavours that I don't remember anymore. And people were lining up, ready to pay even $10 for a pound of pasta, something that would not happen today. Aside from the pasta shop, they had a breakfast counter, and they used to bake bread, sweets and cookies to fall in love with. I've never had a better olive bread or cinnamon roll. Let alone the chocolate chip cookies or the almond paste torte. A couple of years ago I happened to be in Berkeley and I walked by Shattuck Avenue, hoping to buy a loaf of bread and some dried tomatoes packed in olive oil. But there was no sign of the old Pastificio, it sunk with the economic crisis of the new millennium. What a shame. Luckily, I was able to save few recipes that I learnt here and there just by watching my "colleagues" at work. 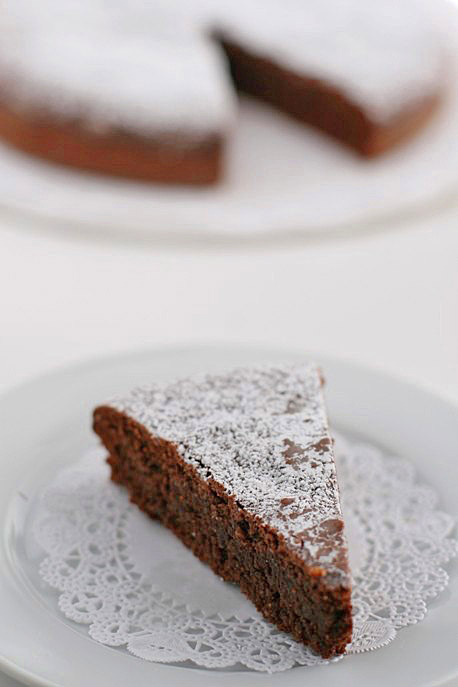 This cake, they would make it every day, and it was always a hit, long before the gluten free trend. Back then one would simply say flourless instead. Melt butter and chocolate in a double sauce pan over boiling water, let it cool down and then fold in the eggs, one at a time, salt, vanilla and sugar. Beat well with the mixer. In the end, add pecans, lightly toasted in the oven and fine ground. Pour the dough in a round pan, buttered and dusted with flour, and bake at 350 for about 40 minutes. Let it cool on a rack, dust with powder sugar. Looks like this will be an all time favorite with kids. It's easy to prepare and makes in less than an hour. I just have to make sure that the kids visit their dentist with their penchant for chocolate these days. Pruitt, for his part, said in a statement that he intends to run the agency a way that fosters both responsible protection of the environment and freedom for American businesses. Trump offered the job to Pruitt Wednesday morning during their face to face meeting and the Oklahoma Republican accepted. Pruitt has been on the transition radar for some time and swiftly emerged as the favorite for EPA.. But I trying to Oakley Sunglasses Sale UK imagine what that move in Sac Longchamp Solde day will be like for the young woman who opens the door and sees that the other half of the dorm room is being occupied by Ledecky. Hi, I just won four gold medals at the Olympics. What did you do this summer?. It's basically two Longchamp Soldes Destockage very highly educated black women playing the dozens in this kind of bougie form of the Michael Kors Purses Clearance letter. That story actually came from, sadly, something slightly autobiographical my mother sent me what she called a care packet, that had a bunch of crap from my childhood in it, and there was a letter from my childhood bully's mother in there, talking about what a terrible child I Bolsos Michael Kors Baratos was. I called my mom immediately, like, why Ray Ban Sunglasses Sale UK did you send this to me, this is a terrible letter. ثم قومى بتنظيف حوض غسل اليدين من الداخلو الخارج، وهذا بوضع اعداد مناسبة من سائل التنظيف بداخل الحوض وفركه جيداً باستخدام فرشاة مخصصة، ثم القيام بوضع اعداد مناسبة من سائل التنظيف على فوطة مبلله وفرك الحوض جيدا من الخارج، ثم اشطفى الحوض بالماء من الداخل ومن الخارج للاستحواز على النظافة المطلوبة.